Please watch the video below. Aquila Red Series strings are not covered by any replacement warranty per Aquila Strings. These are delicate strings and require proper replacement technique and stretching. Please watch the video below. PLEASE NOTE: the wound strings used for all Aquila ukulele sets such as soprano low G, concert low G, tenor low G, baritone in guitar tuning, and a few other varieties that use a wound string, use a very fine wire wrapping on the wound strings in order to produce their excellent tone. These strings do not have the long life span of the more durable but poor sounding wound strings offered by other manufacturers. Players who use Aquila ukulele sets with wound strings please be aware that the wound strings will need to be replaced much more often than the plain Nylgut strings that make up the rest of the set. We advise that players purchase 3 or 4 extra single wound strings with every set. When played often a wound string may last only about 1-2 weeks, which is also dependent on the condition of the frets. This is considered to be normal wear for these strings and is not a defective string. 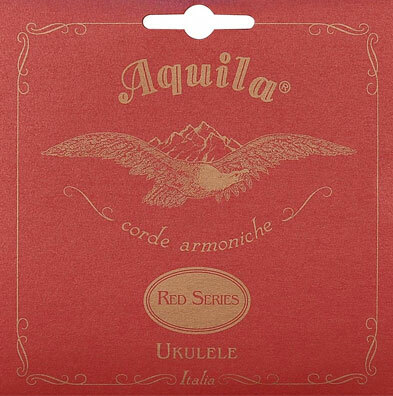 Players who do not want to replace strings as often are advised to use Aquila ukulele sets that have all Nylgut strings, which are most sets that have a high g. The Red Series strings must be stretched by your fingers in a gentle way. Not too much. They will settle up in tune in 2-3 days. Full set of Aquila Red Series Strings designed for Banjo/Ukulele GCEA Tuning. Starting with Nylgut, Aquila adds red copper powder to increase the density of the string to almost twice as much as standard white Nylgut. This results in a stiffer string capable of lower tunings, less breakage and better intonation. Filing of the nut slot may be required. To avoid potential problems, please make sure the string slot in the nut is wide enough. This is easily determined by putting the string in the slot and visually checking the fitment before installing the string. A radiused lower edge at the fingerboard side is also very important. Some ukes have a sharp lower edge. These strings are very reliable under correct conditions. I actually have not put these on yet, but they were a great price, and they came very quickly. I will look here first to order again! Excellent service, will buy again. Q: How do these strings differ from the Aquila reds for concert ukulele? Not sure exactly which of the RED Concert sets you were referring to but I did find a scale length difference as well as gauge difference when I compared them to the 85U set.